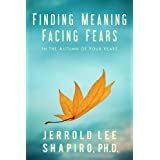 In Finding meaning, facing fears in the autumn of your years author Jerrod Lee Shapiro, Ph. D. addresses the 45-65 years of life, where we are no longer "young" nor are we "old" by Western society's definition. This book takes a look at some of the more common experiences that occur during this age-range and how individuals can grow through the period in order to have a more fulfilling and meaningful life overall. The book is divided into four parts: the basics; challenges and characteristics; planning for retirement; and realities and opportunities. Each section has exercises the reader and, if one is present, the reader's partner can complete to explore personal growth opportunities. The Basics: Of concern is the common statement sixty is the new forty, or some such similar statement. Instead of calling our current 60 the new 40, it may be better to call it the new 60. The person is still 60 years old; however, it is now expected that there will be significantly different life experiences than those of a generation or two ago had when they reached the age of 60. Previously, a person at the age of 60 was considered old(er) and was expected to retire soon. The post retirement years were expected to be either filled with the activities that could not be pursued when they were younger because of family obligations and/or money restrictions, or they were filled with quickly declining health. In this section, Shapiro gives the reader the opportunity to study different types of ages, such as "chronological age, body age, psychological age, social age, functional age, and reference age" (2012, p. 18). Now, people are beginning new careers in their 60s, including returning to get an extensive education in order to reach that dream career goal. Today, career work is an opportunity to express life purpose and find contentment within oneself, not just a means to a paycheck. "Facing the fear is what's important, not taking unnecessary risks, but being willing to meet the challenge" (Shapiro, 2012, p. 32). While it is normal to have fear, defining whether one's fear is realistic and surmountable or if it is neurotic fear that stands in the way of progression is a major part of the journey. As Shapiro states, "neurotic anxiety cuts off the process of considering whether our novel thoughts, explorations, and actions truly are as frightening as they seem. They obviate our quest for personal meaning and opportunities for courage" (2012, p. 35). A significant number of people spend a great majority of their lives doing what other people expect whether it makes the individual person happy or not. This period is an opportunity to become more self-aware. Challenges and Characteristics: As one moves through the autumn years, there are expected losses. Death of family members, especially parents, friends, and acquaintances/colleagues are foreseeable. This leaves a person in their autumn years facing a new perspective: being the oldest generation in the family. Changes in physical appearance and abilities, such as vision, hearing, memory, physical strength, and bone mass are of increasing concern (2012, p. 55). There is a need for a shift in saving and spending habits in order to successfully get through retirement years in terms of the financial outlook. Career changes must be more carefully considered because there are seemingly fewer new career opportunities for someone nearing retirement age. Relationships also change; once the children have moved out of the house, it leaves a big gap in the focus of the marriage. This is an opportunity to renew the relationship and deepen the connection, or separate and move forward with one's life. Further, one may wish to review choices made in earlier days to reflect upon how those choices create one's current life. As part of that reflection, there is a need to "review and evaluate the past in order to determine which aspects to keep and which to reject as we consider our future dreams and wishes" (Shapiro, 2012, p. 65). The author shares stories of successful transitions to include the challenges faced as well as examples of stagnation where there is evidence of a person being stuck in an earlier developmental period. Exercises in this section allow for an understanding of the best and worst times of life, what made the best times special and the bad times difficult, skills used to navigate those earlier experiences, skills needed to get through the current stage, and skills that need to be developed. The author addresses being a part of the sandwich generation where both parents and children need care. He suggests having conversations with one's parents, siblings and partner to determine, if the parent does need either financial help or assistance with daily activities of living, who will help and where will the parent live. This additional stress causes a great burden on couples as well as the children remaining in the home. The author stated it is important to have a full understanding of the finances of one's parents so plans can be made to make the money stretch as far as possible to cover expenses. This reviewer would have liked to see more discussion related to the legal documents, such as powers of attorney, that allow for a caregiver to make healthcare and financial decisions for the parent. While it is best to have these created by a lawyer in order to ensure the best legal verbiage, these documents should be in place as early in life as possible and be kept up to date when life changes occur. During the autumn years, time feels like it is a speeding train. Life feels more hectic, but in large part this is because it takes more time to accomplish basic things. What previously took five to ten minutes now takes ten to twenty minutes. Understanding that our bodies are moving slower than our brains means having a better understanding of how many commitments we can make and still have balance in our work and personal lives. "One of the keys to success during the autumn years is to stop putting off till later what is best for us today. It's time for a conscious acknowledgement of how to best spend our time" (Shapiro, 2012, p. 134). "Don't put off till tomorrow what can be done today" (Shapiro, 2012, p. 137). While this was previously related to doing tasks and fulfilling responsibilities, in the autumn years this also applies to pursuing activities that bring happiness and contentment. Being present and focused on current activities increases satisfaction with one's life. Planning for Retirement: The book offers recommendations for topics that offer honest and meaningful conversations with your partner and, potentially, children/future caregivers. Instead of ignoring the issues of where and how to live as well as how living will be afforded, addressing for the different potential outcomes in the autumn years will make the transition easier. Additionally, determining what you will do after retirement – how you will fill your time, fill the need for friendships, and find purpose as opposed to sitting and wasting away – is important to explore during the autumn years. Here again, the book offers a series of questions and exercises in which the reader can explore their hopes and fears about what their post-retirement life will look like. It also offers examples of pitfalls and traps of expectations and desires between partners and on an individual basis in this period of transition. Realities and Opportunities: This period of life comes with an increasing number of health problems, changes in the normal functions of the body, a higher risk of depression and anxiety, new types of stress, which often stem from "feelings of overload, interpersonal conflicts, and time demands [as well as]….threats of loss, danger to the status quo or person, or increasing frustration" (Shapiro, 2012, p. 193). In order to face the realities of the changes, many people renew their religious practices and search for meaning through a spiritual journey. This spirituality allows the person to find peace with their current life and acceptance of choices and losses. Living longer means we, as a society, must define new stages of older life allowing us to identify expectations, strengths, weaknesses, opportunities, and situations that cause us to feel insecure. Most of us prefer stable and predictable patterns and habits in life, but those patterns, habits and behaviors do not save us from having to face our autumn years. We can either face the changes head on and embrace the opportunities or we can stagnate and fail to grow through the changes. Through exercises and real-life examples, the author takes the reader on a journey of self-exploration that allows for the personal growth needed to face the autumn years with courage and grace, and to have a successful transition that is happy as well as healthier than many of our generations-ago predecessors experienced.